In the end it was what he didn't say that did for John Delaney. 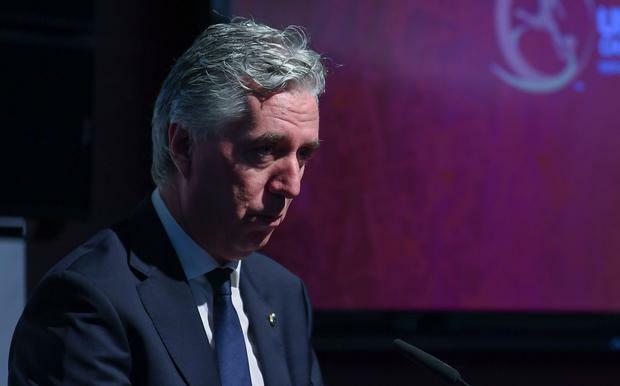 His decision not to take questions at the highly anticipated Dáil committee showdown at Government Buildings proved to be the final blow in bringing down a central pillar of the FAI, already on shaky ground. Reputation is far easier kept than recover, and Mr Delaney has been under the pump for too long to remain at the helm. A divisive figure to begin with, the fact he managed to survive for 15 years was remarkable. There is a sense that anyone who rubs against convention is courting an ignominious fate; and there can be no denying Delaney knew how to ruffle feathers. There are many reasons why Delaney had to step aside. When the mystery surrounding the €100,000 "loan" first emerged, total candour and a complete explanation was the least we expected. The days when accountability and transparency might ring hollow in the public echo chamber are long gone. Scarce resources must be used to maximum effect. Organisations which turn over hundreds of millions over the years come in for scrutiny and audits, and answers are a fact of life. Especially where public money is concerned. There can only be zero tolerance for secrecy or obfuscation. Delaney rode his popularity too hard. His iron grip on the FAI started to slip when the grassroots began to grumble as to why the most popular sport in the country was still the poor relation when it came to facilities and resources. A craving for success on the international stage went unsatisfied. Meanwhile the GAA and the IRFU went from strength to strength. As Ireland fell down the rankings, failing to qualify for the prestige tournaments, Delaney's €360,000 salary and extraordinary perks came into even sharper focus. In a results-driven environment, performance and reward seemed out of balance. But there was an even more significant problem. Corporate governance issues were drawing attention. The State was sinking tens of millions of taxpayers' money into the FAI. And taxpayers have an absolute right to expect their money is supporting an association that is an exemplar in best practice. The questions grew more pressing - simply stonewalling would not suffice. So there was little surprise when a member of the Oireachtas Committee on Sport claimed it had been "agreed across the political spectrum" that the entire board of the FAI must resign. Fianna Fáil's Robert Troy said it was "very disappointing" the length of time the FAI board was taking to get back to the committee with answers it could not provide at last week's meeting. When the train stays on the tracks no one needs explanations: but when things go off the rails they have to be provided. John Delaney's failure to recognise the urgency in furnishing them sealed his fate.